tpdnews: Recognize him ?? Please contact us. 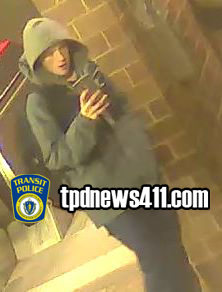 The subject depicted above is wanted for questioning relative to a Malicious Destruction of Property at JFK/UMass Station on Saturday, April 7, 2018, at approximately 12:30 AM. The subject kicked out a train car window for his own amusement. This cost the taxpayers of Massachusetts hundreds of dollars and the train car had to be removed from service.